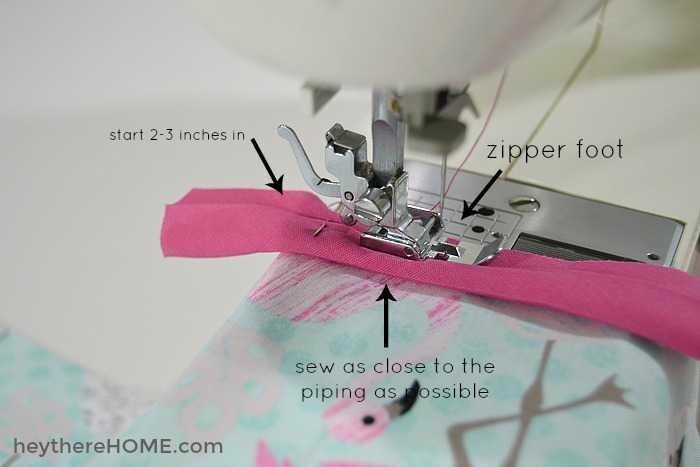 Inside: The easiest explanation of how to sew a pillow cover with piping! Even a beginner can do this! If there is one way I’ve added a ton of color, character, and pattern to my home and saved some cash it’s by taking on the challenge of teaching myself to sew well enough to make my own home decor. 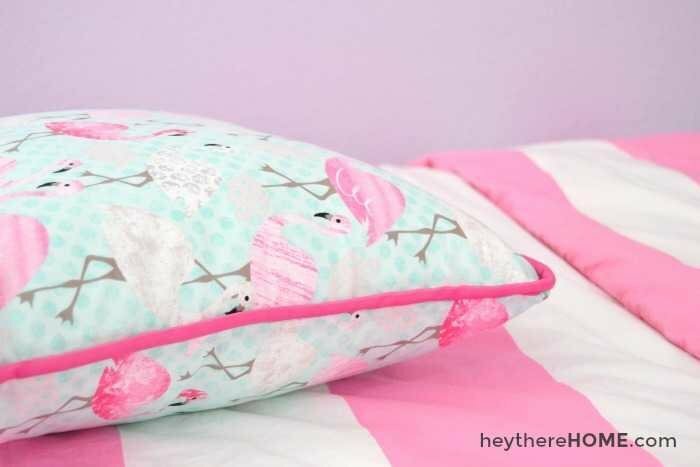 And since pillows are pretty much my favorite thing next to mixing fabric patterns, I thought it was high time I show you the easiest way to sew a pillow cover with piping. I promise if you can sew a straight line, you can do this. It is that easy. I’m excited to be partnering with my go to home decor fabric source, Fabric.com, to bring this easy-to-do sewing project to the blog! 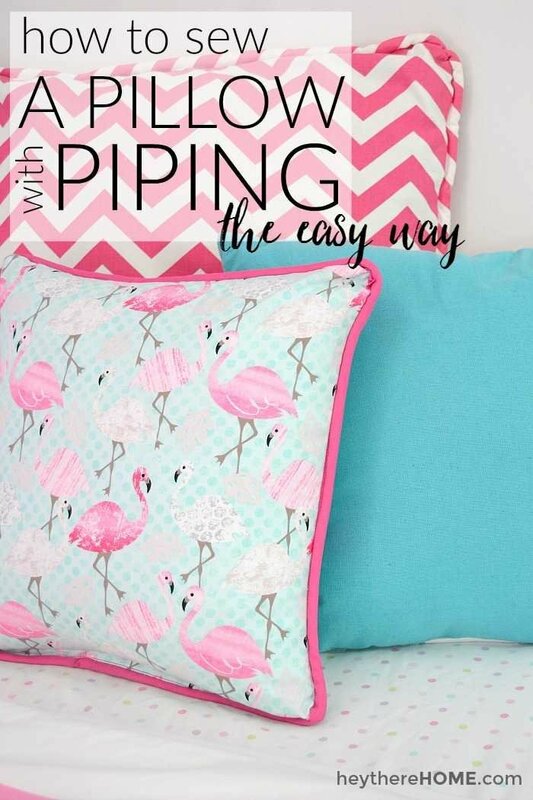 Adding piping around the edge of a pillow is a really fun way to either bring out one of the colors in your fabric pattern or add a really fun pop of contrasting color. I used to create my piping piece in a completely separate step until I got smart and realized that there’s a much easier (and faster) way to add piping. Not to mention doing it the way I’m about to show you makes it so you will never again have that extra stitch line showing on your finish pillow cover. So frustrating, I know. You’re welcome. Fabric cut to the size of your pillow form. (For example if your pillow form is 18 inches square, you’ll need a front piece of fabric cut 18 inches square. The back piece will also be 18 inches square if you are making a zippered pillow cover, but if you are doing an envelope pillow cover your back piece will actually be 2 pieces. 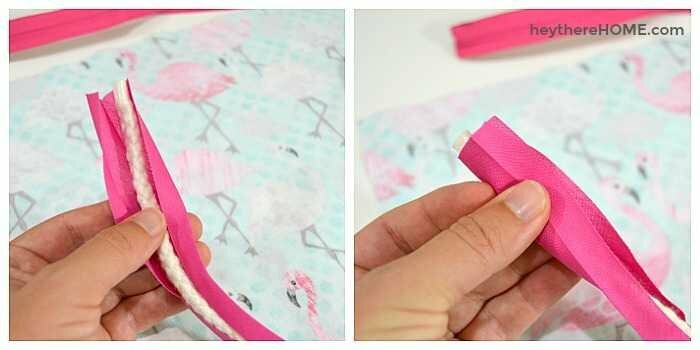 Bias tape in the color you want your piping to be. Your bias tape needs to be wide enough to wrap around your cording and still have about a 1/2 inch seam. RELATED: Instructions for a zippered pillow cover or an envelope pillow cover. 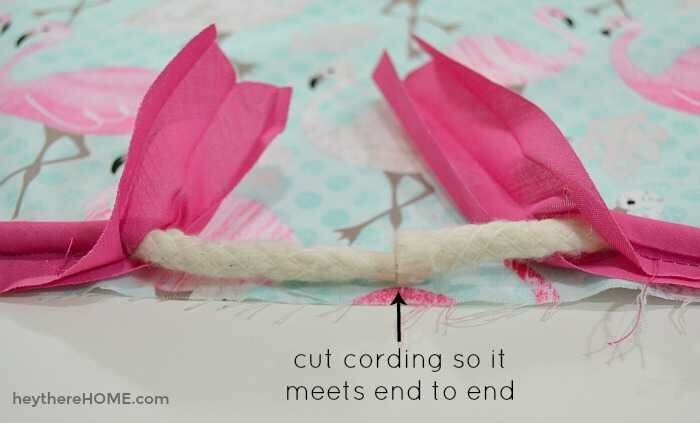 Step 1: Fold your bias tape around your cording. Remember you want your bias tape to cover the cording and leave about a 1/2 inch extra when the edges of the bias tape are lined up. Step 2: Grab the front piece of your pillow cover and place it in front of you, good side up. Step 3: Starting in the middle on the bottom edge, place the raw edge of your bias tape along the raw edge of your fabric. You want all 3 raw edges to match perfectly. Step 4: Pin it in place about 2 inches from the end. On to the machine! You got this! You will want to use your zipper foot for this so that you can get as close as possible to the cording. Step 5: Place your piece on your machine and lower your zipper foot right after your pin. (You want to leave about a 2-3 inch portion of your piping unsewn for now. Step 6: Start sewing with a straight stitch right along the edge of the cording. You can see the lump that your cording creates inside the bias tape. Sew right along that line. 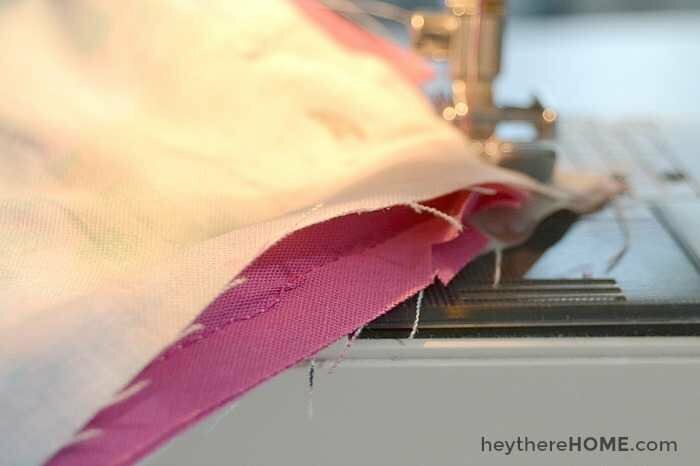 Step 7: When you get about an inch or two from the corner, stop with your needle in your fabric and using your scissors, make about 3-5 snips into the edge of your bias tape. This will allow you to turn the corner without screwing up the cording. Step 8: Go slow and continue and when you are about 1/2 inch from the end of that side, stop with your needle down into your fabric, lift your foot, turn your fabric and line up the piping on the next side. Then lower your foot, and continue down the next side. Step 9: On the final side, stop sewing about 2-3 inches before you get back to where you started. Step 11: Fold the bias tape on the side you were just sewing around the cording as if you were going to continue on. Pin it so it stays just like that. 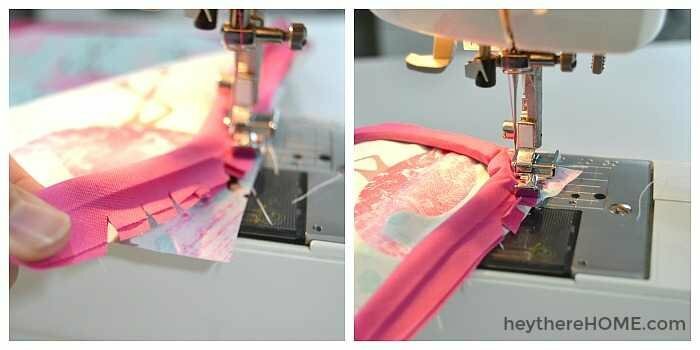 Step 13: Take it back to your machine and start your stitch a little before where you left off and go all the way to where you started! You now have piping all the way around the font piece of your pillow cover! Woo-hoo! Okay. Now you need to make a decision. Are you going to go for it and make a zippered pillow cover? Or are you going to make an envelope pillow cover? Either way I have you covered. 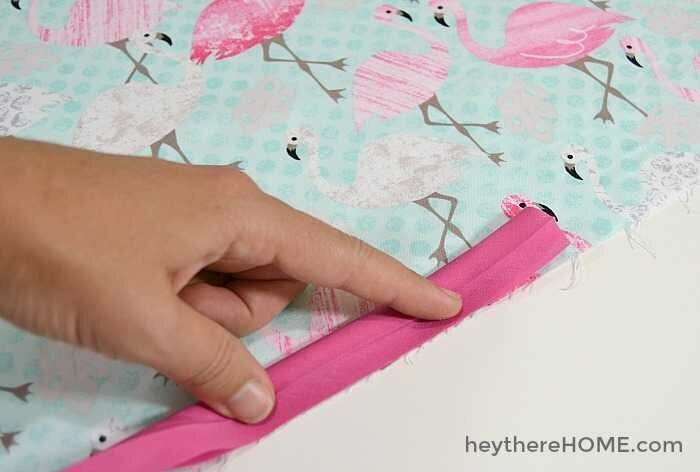 You have the piping on your front piece so now it is just a matter of following the steps in either my zippered pillow cover tutorial (that is so easy even beginners can do it!) or my easy envelope pillow cover tutorial. 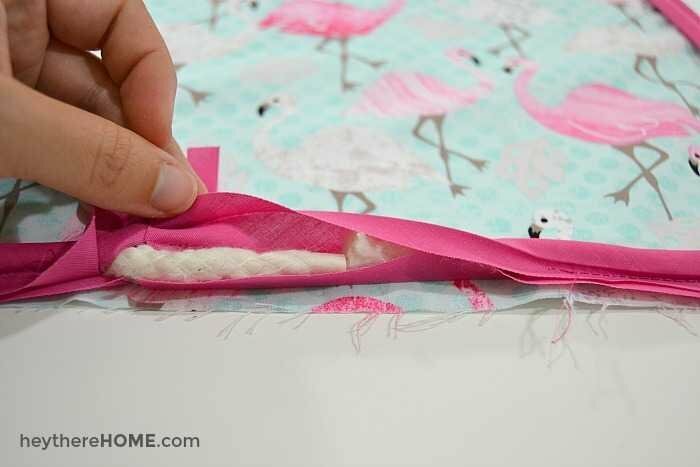 Regardless of which type of pillow cover you are making, make sure that when you are sewing the back piece on, the little pieces of bias tape that were created when you made your snips at the corner need to be laying flat. If they aren’t, they will be poking through the front of your finished project, and your corners will be no bueno. 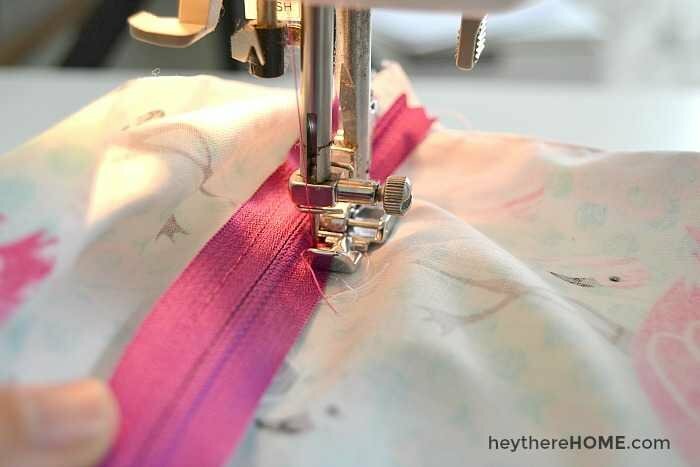 If you are going for it and adding a zipper, be sure that when you are sewing the zipper on, you aren’t going through the piping too. To make sure, lower the foot and then lift the fabric and peek under to make sure the piping isn’t pressed down under the foot. In fact, stop and check every little bit. And once you are all done, it’s time to turn that baby right side out, add your pillow insert, and admire your handiwork! My little lady was really excited to come home to her newly refreshed bed after her first day of school! A big THANK YOU to Fabric.com for sponsoring this post! As a long time customer it is a true honor! Can’t get enough of sewing tutorials? 2. So if u use your zipper version pillow pattern w/ the zipper being on the side…….where does the piping go on the side w/ the zipper? Hi Kathy, I did use fabric on the chevron pillow for the piping. I just cut strips of fabric and put it around the cording the way you would with bias tape. I’m not sure this is the official way to do it, but it worked. There’s a section toward the bottom of the post that talks about adding a zipper. Basically you want to make sure that when you sew your zipper you’re grabbing the edge of the bias tape/ fabric but not sewing through the cording part. The piping will be on one side of the zipper in the end product. Hope this helps! Hi Corey- thank you for the clear directions and pictures! I made a pillow and then decided it needed something additional on it to make it pop. The only piping I could find that was the matching color I wanted, is a solid round twisted rope piping without any additional fabric wrapped around it.. What is the best way to hand sew this on the pillow? Hi Diane! You’re so welcome. Unfortunately, you can’t add piping of any kind once the pillow is sewn together. It has to be done when the two sides are apart. Maybe next time! In my head it would be placing the front side wrong side up and the cord and bias tape facing inwards not outwards. Maybe it’s just that I can’t pursue it. What happens with the 3 edges after the cord is sewn on? Do you have a photo of the finished front piece? Very grateful for any help you can offer! Hi Mim, It’s good side up. See the 4th image down. The reason is that when you add your second piece the piping gets sandwiched between the two pieces for when you turn it right side out and add a pillow. Hope this helps! Hey Corey, Thanks! I think my brain went on holiday that day. I’ve since completed the cushion cover successfully and am quite pleased with it. Thanks for the tutorial! Woo-hoo! Yay you, Mim! Glad it helped you get a successful finish! Has anyone successfully used upholstery thread,,if so what sort of machine was it. TiP. I live in Australia and go to an professional upholstery shop to buy piping for 10-20 cents a meter. Once you professional piping you won’t bother with the flimsy cotton as this one holds its shape. Hi Vicki, I haven’t. I typically just use a thicker thread with my machine and it’s worked just fine. Let’s see if any readers comment who have used it. Hi Corey! Do you ever install the fold or flap zipper, rather than the straight down the middle zipper? With this type of installation, the teeth of the zipper don’t show. Also, do you ever install the zipper, rather than in the bottom seam, a quarter of the way down the back side of the pillow? 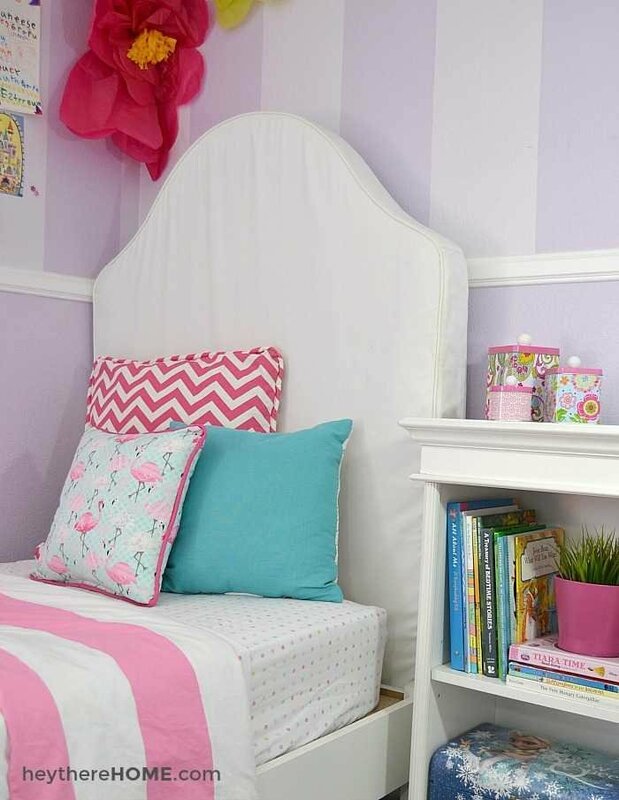 Would this be the best way if I am using a trim on my pillows? Thanks for making sewing less scary! Hey Suzanne! I use an invisible zipper so the way I do it you really can’t see the zipper in the end. I’ve never sewed it in the middle of the back side of the pillow because if you want to lay on it you’d only be able to lay on one side. You can still do trim on your pillows and do a zipper, like I did in the piping post. Hope this helps! I’m about to start to make my first pillow thanks to your tutorial! One question though: what size cording did use for this pillow? Hi Kate! I don’t remember. It really is all about the look you want, so choose the size that best suits your style 🙂 Be sure to email me a photo of your finished pillow! Thank you for this DIY tutorial. I am eager to begin making my red nautical throw pillow with purchased navy blue cording and…a zipper! Am I missing something in your instructions? Thanks for any help you can give me. Hi Kathleen, great question! I’ve found it’s always best to cut your pieces the exact dimensions of your pillow form even when using cording. I’d love to see how your nautical pillows turns out! Seems like the fabric would need to be cut just a little larger than the form??? Hey Mary, thanks for the input. One would think that would be so, but I’ve found that cutting the fabric the same size as the pillow, not adding any seam allowance gives me super plump pillows with no “dog ears”! I might add in a little extra if the forms were stiff, but if they’re nice and “squishy”, a same size cut is the way to go! Love it! Thanks for the very clear step-by-step. It came at an appropriate time as I have a quick cushion cover to make in the morning and really wanted to try piping this time. Pinning this now! You’re so welcome Nik; glad you found it helpful! Hi Corey – Thanks so much for your DIY help. I’ve a question about using decorative trim cording on my pillow covers. I purchased a heavy, thick decorative cording at Hobby Lobby to cover my pillows, however, I am not sure whether I should wash the cording prior to applying it? The cording is really stiff and is going to be a challenge to apply it. Any suggestions? Hi Esther, great question! I don’t usually wash the cording before using it, but in this case if you think it will make it softer and easier to use, then I definitely would. There is a chance it could fray in the wash, so you may want to hot glue the ends before washing or clip the ends with either a rubber band or something to hold it together while you wash it. Can’t wait to see how they turn out! I found this web page very successful because I found some useful information about the sewing machines and the project work related to the sewing threads. I am researching various information related to textile fibers and fabric printing techniques. Thank you for the tutorial. My first grader loved her new pillows and she thinks the piping makes them look like the came from the store. I’m so thrilled that your pillow turned out awesome! Thanks, Ann! Great tutorial! Is there anything you need to do to the ends of the cording to stop it from fraying?? I followed your tutorial and after washing it I noticed the ends of the cording frayed inside and went flat! Hmmmm… I’ve never noticed this happening, Teresa. But a quick solution would be to use hot glue on the ends before sewing the piping in. That should keep it from fraying. Another idea would be to sew the ends of the piping to the bias tape, although that would leave a small noticeable seam, which would be fine I think. Hope this helps keep your pillows happy! Thanks for stopping by. Beautiful. I can not wait to try. 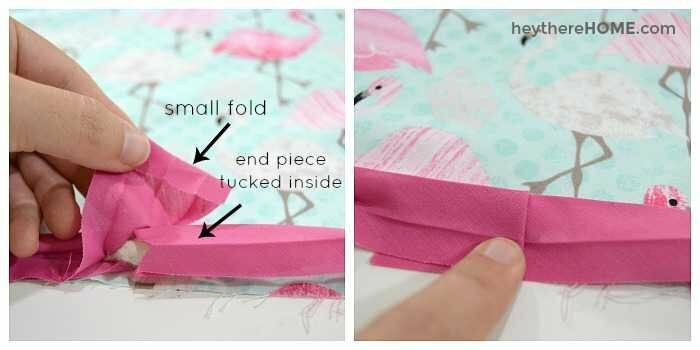 Could you share the name of the flamingo fabric please. I love it. Hey Maggie. 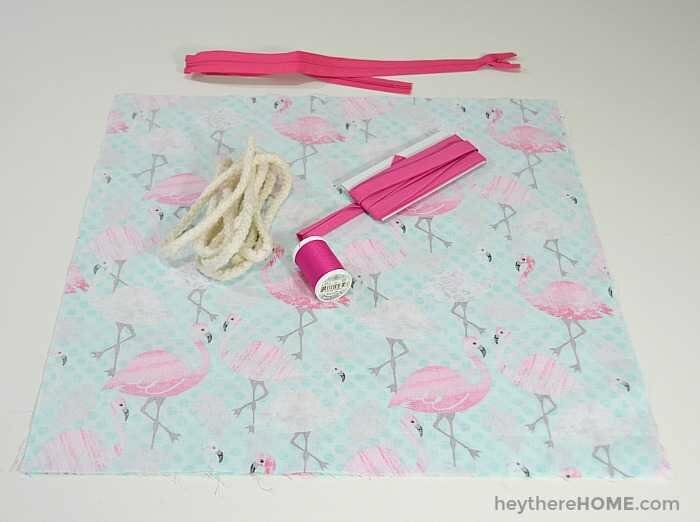 The flamingo fabric was linked in the post, but in case you missed it it is right here. I have used piping in many sewing projects over the years. The new zipper foots on most machines makes it so difficult to get close to the cording so that there is not a gap. 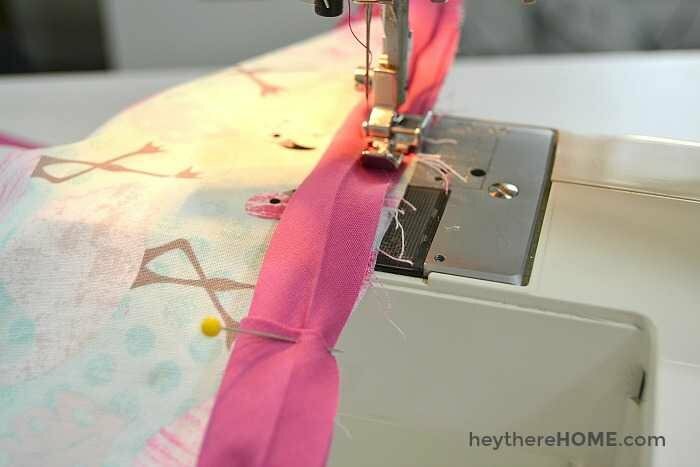 Any tips on a newer sewing machine with a zipper foot like the ones on the older machines….what a help that would be! My ancient old machine died and ever since getting a modern machine I get upset every time I use the zipper foot. Deb, are you able to adjust the position of your needle? If so, move it to the left as far as it will go. Then you can get right next to the piping! Deb – I feel your pain – a zipper foot simply does not work well with thick cording. The good news is that for around $5 you can buy a specialty sewing foot for cording. The foot rests on top of the fabric and has a groove for the cording to run underneath the foot. The fabric flows under the foot as if it is riding on a tiny rail track, giving you a straight line and a close stitch. A big thank you to both Rebecca and Kerstin for your helpful suggestions! I love colorful pillows on my beige couch also! And I change them with the seasons too. If you use double sided quarter inch (comes on a roll) Fusible tape, you can more easily add a zipper. I cut it into a eighth of an inch, as long as the zipper on both sides of it. No pins! You can glue it too. Thanks for the top Peggy! Pretty pillows! You did a great job showing us how to do the piping. Thanks for sharing and thank you for your time in taking the photos ,posting and sharing your expertise.